If you want to create a new PDF file from common document formats like Word, presentation, images, web pages or split the existing PDF file or merge many files into one file or extract images, rearrange page orders, sign the PDF or insert security certificate, add a bookmark or insert watermark, attach a file or anything like that, these free and easy to use tools will help you. Along with the basic feature of splitting and merging PDF file, it also allows to rotate the page orientation, reorder the page sequence. The Merge feature keeps your forms and styles intact. You can add your 'Password' to the resulting PDF file. The software is easy to use, light on the system and Free. Download the PDF Split and Merge here. It is a specialized tool to arrange the page order in pdf file. It provides a visual interface to drag and drop the pages and arrange them into the custom order and then save the PDF. Download the PDF Jumbler here. doPDF simple yet excellent PDF creator. doPDF installs as a virtual printer and then you can convert any document into a PDF which has a print option. When you hit the 'print' command, select the doPDF as a printer, and it converts the document into PDF. The converted PDF file has the searchability, so it does not convert the texts in PDF to an image, it is an exact PDF file. You can set the page size of resulting PDF. You can embed the font into the PDF file so that it does not lose the formatting and open correctly anywhere. You can set the output folder and the viewer after completion of conversion. It is free, very fast and light. Download DoPDF. This is a very advanced and batch processing tool for PDF files. PDF file page size can be changed to any custom size irrespective of the original size of pages of the PDF document. You can add a custom image based watermark or a semi-transparent text based watermark and page numbering. The shuffle/N-up feature is a great way to have multiple pages on a single page. You can arrange the multiple pages from the same PDF document into a single page. 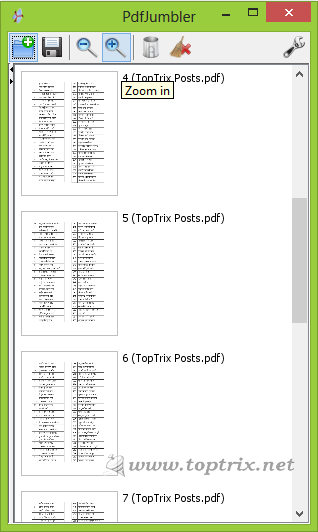 You can add your own custom preset bookmarks to any PDF file. 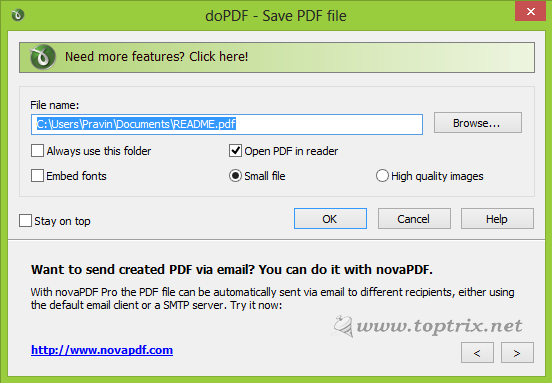 The 'Add file' feature allows you to attach an external file to a PDF file. You can use it to add some special font files used in the PDF file so that if the document is opened into the new computer which does not have installed the targeted font file, still then the formatting will remain intact. The other great feature is 'Interaction'. You can preset, how the PDF viewer will show the file. You can preset whether the toolbar, menu bar, UI, bookmarks bar, and such other PDF viewer tools should be shown or not while viewing the PDF file. PDF encryption to hide sensitive data. Can add the digital signature and certificate. 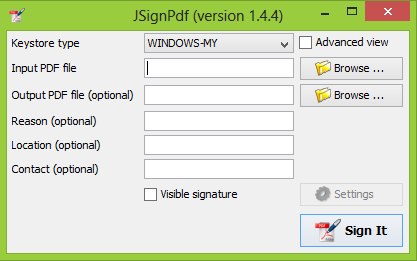 This is a specialized signing tool for PDF file. It gives more customization feature for your signature and certification. You can download jSignPDF here.